If an artiste cannot come to terms with the pulse of the people he is destined to live with, he can never offer a masterpiece to the very society. 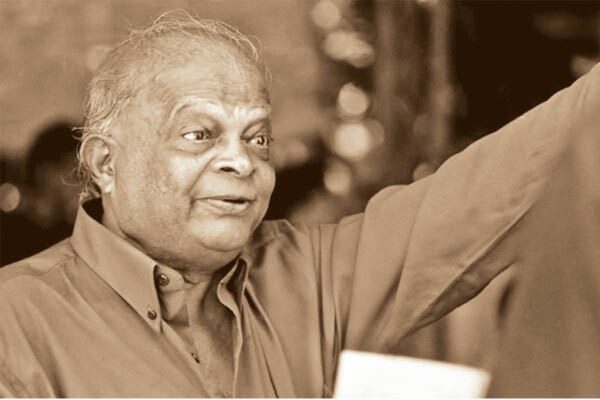 Dr Premasiri Khemadasa belongs to a rare calibre. The artistes of that calibre stood against the injustice and stood with the righteous. Dr Khemadasa was quite brutal when composing music. His sole aim was to reach culmination with his creation. Such rare-calibred artistes must never leave us despite their bodily departure. He was not just a Master, but he was full of humanism who even the kings could not buy. 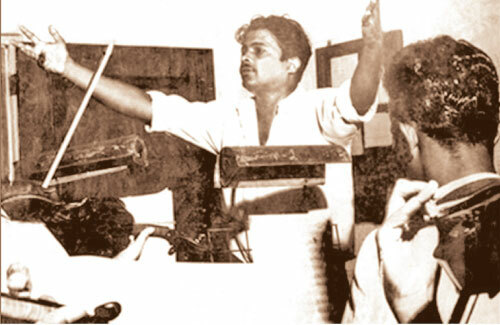 It was 1982, and he was awarded as the best music director for Dharmasena Pathiraja’s Soldadu Unnehe. Cameras panned in the direction of Master, who stood up at the announcement and left the premises rejecting the award, protesting against the unfair imprisonment of Vijaya Kumaratunga. And now, he remains a forgotten legacy. The corporate sector dishing out billions of funds to gala events to choose the best singers and imitators maintain the stoic silence. That disturbing stance has compelled Kites Events to initiate the move to celebrate Maestro’s legacy with a music concert. Scheduled to be held at the BMICH on October 23 at 7.30 pm, the concert commemorates the 10th death anniversary of Maestro Premasiri Khemadasa which falls on October 24. The concert titled ‘Obada Mada Viya’ is a collaboration of Kites Ads & Idea with Gayathri Khemadasa and Anupa Khemadasa. The official media sponsors are Sri Lanka Rupavahini Corporation, Neth FM and Associated Newspapers of Ceylon Ltd.
cantata Pirinivan Mangallaya shows his influence from the oriental philosophy. All his creations contained more or less oriental themes. For him, Jataka stories had musical components, and Buddhist suttas have the capacity to tremble the earth if delivered in a proper melodic sense. When he introduced these foreign styles, he was scoffed at primarily for the impossibility of grasping operas, symphonies, and cantatas. Music is a universal language, which transcends the mortal verbal order. They are not to be understood, but to be ‘felt’. The Master had immense trust in words. If the wordings were appealing, any poem or lyric will become a libretto for him. He would consider it a treasure, though the Master claims the ownership of the libretto afterwards. “It’s a matter of converting textual order into a musical interpretation. We should ‘feel’ the rhythm of words, and then only we enjoy the musical interpretation,” he was once quoted as saying to a few of his close associates. Obada Mada Viya will feature Maestro Khemadasa’s musical contributions to films, stage plays, teledramas, miscellaneous songs and opera orchestras. The Khemadasa Foundation students together with Amal Perera, Mihindu Ariyaratne, Pradeepa Dharmadasa, Sandhya Bulatsinhala, Lesley Fernando and Indika Upamali will offer the voice contributions. Gayathri Khemadasa will direct music to the concert. The concert will feature over 25 musicians. This concert will not be confined to the Colombo elite but will be expanded into rural areas to reach out for a wider base of Khemadasa fans. ANCL is the print media sponsor of the event.